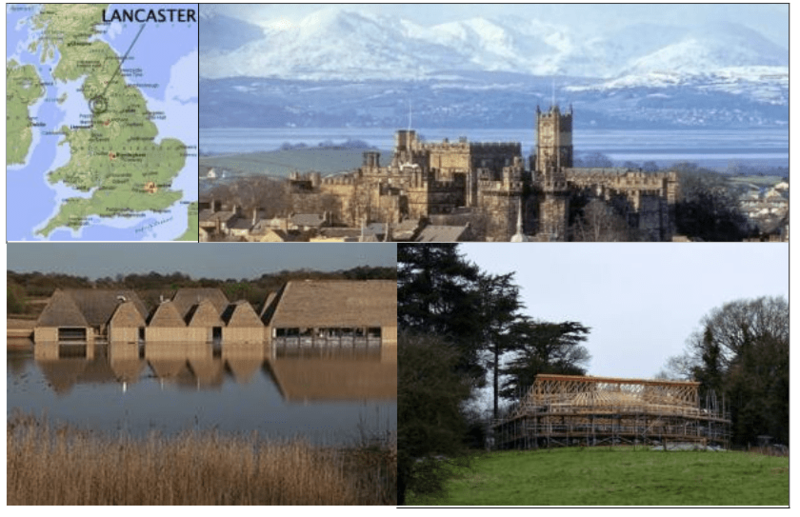 The first RESTORE Training School took place in Lancaster, UK between 14th and 17th November 2017 organised and facilitated by Martin Brown, Fairsnape. Over 40 trainees and RESTORE core group members attended, representing a great spectrum of sustainability disciplines, experience and EU countries. 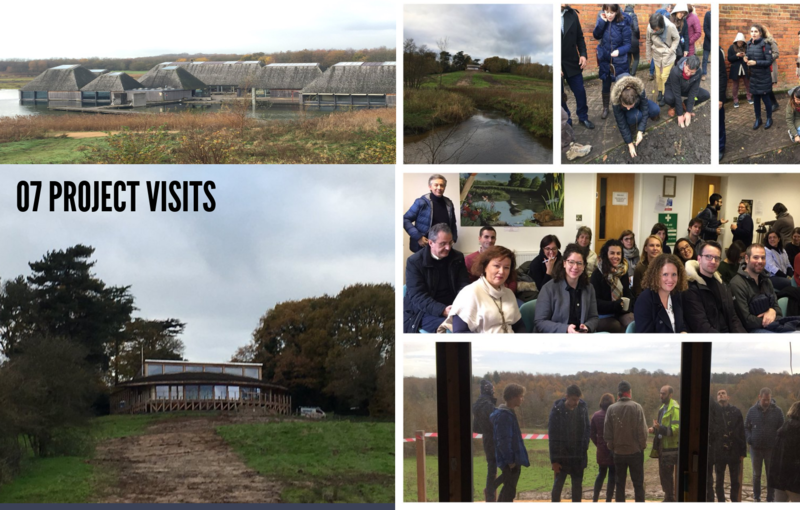 The four days were lead by trainers and guest lectures from the UK, EU and USA, but with a distinct Lancashire focus!. 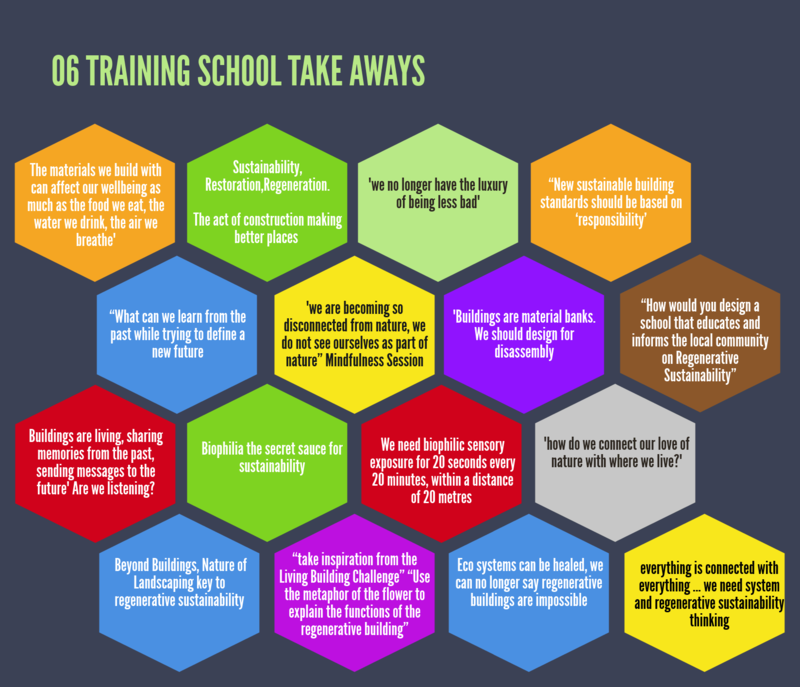 The focus was firmly on Regenerative Sustainability, Biophilia, and Sustainability Education, in four days trainees gained a deep understanding of Restorative and Regenerative Sustainability and the key topics from RESTORE working groups. 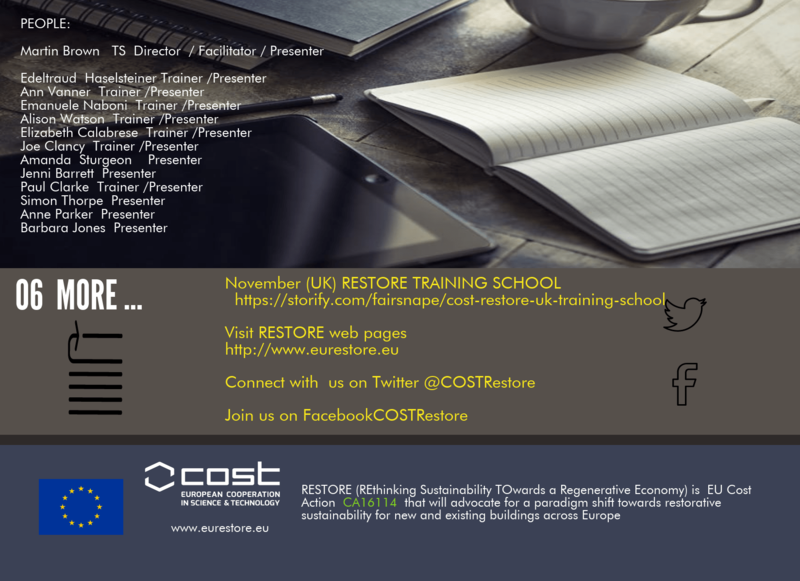 Training school designed to progress the RESTORE Cost Actions purpose. This entry was posted in education, sustainability and tagged COST Restore, education, FutuREstorative, Lancaster, Regenerative Sustainability on November 27, 2017 by martin brown. What does good ‘Facilities Management Sustainability’ look like? And why aren’t we doing it now? I was honoured to be invited to the EuroFM Rese arch Symposium as a guest of EuroFM, held at the recently completed Technology Innovation Centre at Strathclyde University in Glasgow. 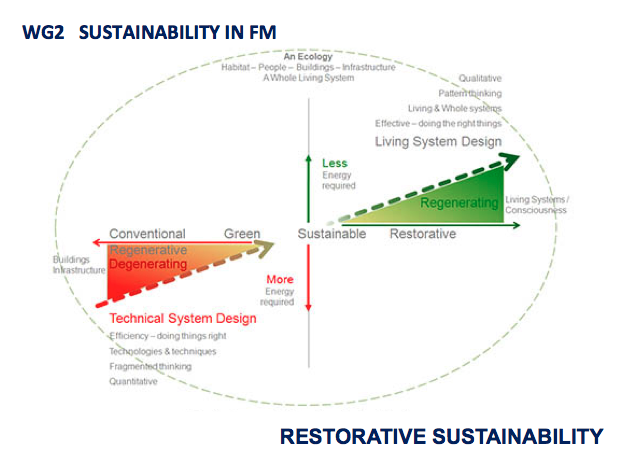 We do not have luxury to continue being incrementally less bad, and with the built environment’s 40% negative impact, the facilities Management sector, (led by the research community) has a huge opportunity and responsibility to flip to being more good. We have been talking about Sustainable FM for at least a couple of decades, but still we haven’t made any real progress. The environmental impact of how we manage facilities is huge, but remains something we struggle to fully understand, to measure and to address. However it was disappointing to see FM research updates or proposals that start from a very dated perspective. Starting from Brundtland’s definition is last decades thinking – and has an odd message, perhaps giving licence to do nothing …. 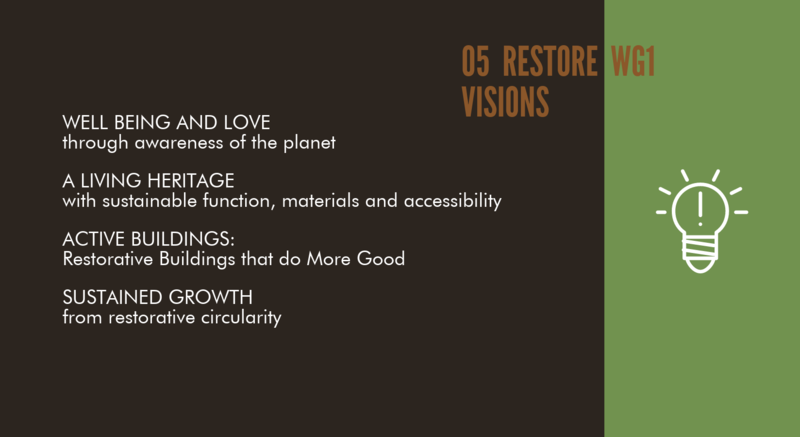 far better to adopt Yvon Chouinard’s (Patagonia) approach – ‘ Sustainability means we give back more than we take” – Restorative or Net Positive FM! I did question the “in depth studies into sustainable building schemes” that have not picked up on the relatively new thinking standards such as Living Building Challenge, Well Building Standard, Cradle to Cradle, Circular Economy and so on. FM research has to be credible and leading edge for practice to listen and adopt. Indeed the claim that FM contributes to the health and wellbeing of people needs to be backed up with evidence. Anecdotally, it is possible that FM ( and the wider built environment) could be putting people’s health at risk – through continued inclusion of toxic materials in buildings, (PVC? Formaldehyde glues? ), a lack of biophilic thinking, promoting lifts over stairways, standing desks, poor air quality, lighting quality and so on. It is on these ‘health’ issues that the Well Building Standard should be a fundamental part of the sustainable FM agenda. I did note that on the tour of the 3 month old BREEAM Excellent TIC Building, prior to the symposium, many of the FM delegates commented on the ‘new building smell’ – unfortunately now an indicator that chemicals may have been used in the finishes and adhesives. It was good to see the work in development on Smart Cities and Internet of Things from Prof Keith Jones at Ruskin University, showing the collaborative joined up research necessary to address complex (as in complexity theory) and wicked problems of sustainable smart cities. Research to Practice was the theme for the end of day panel session where access to research by FM practice was discussed. I still wonder why research is blind to social media? As an example there were only two of us tweeting (myself @fairsnape and Iain @IainMurray) – but still our tweets reached approx 20k accounts, all researchers, would I am sure, like to have seen their research message reach 20k accounts. It was, as ever, a real delight to introduce Living Building Challenge thinking and the Bullitt Centre to the EuroFM Research to Practice panel session. This is where sustainable EuroFM Sustainability FM thinking needs to be, driving a wedge into the future, demonstrating what is possible, not wrestling with a dated definition of sustainability. the World FM Day on 10th June celebrates Building Resilience for the Future as an online debate throughout the day – a great opportunity for the FM Research community to engage and share their work. 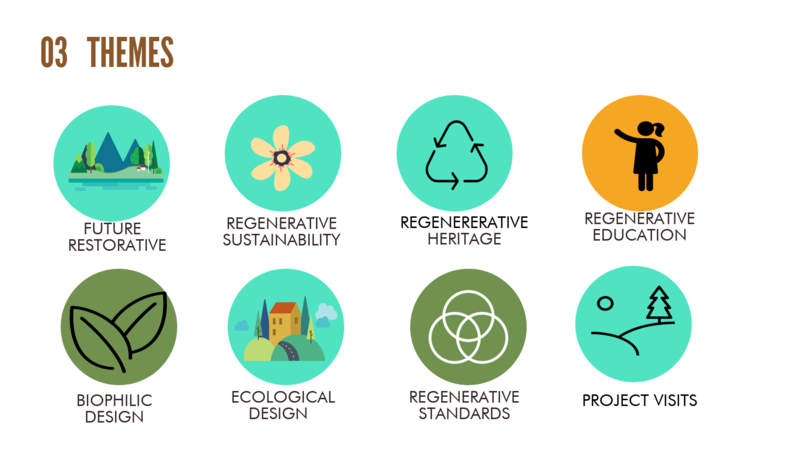 Also on the 10th June the Brightest Greenest Buildings Europe virtual expo opens – again a free to attend event giving an opportunity to learn, share and engage with others across Europe. And, also on 10th June, (a busy day!) our Living Building Challenge UK Collaborative meets at Leeds Beckett to explore the issue of healthy and materials. 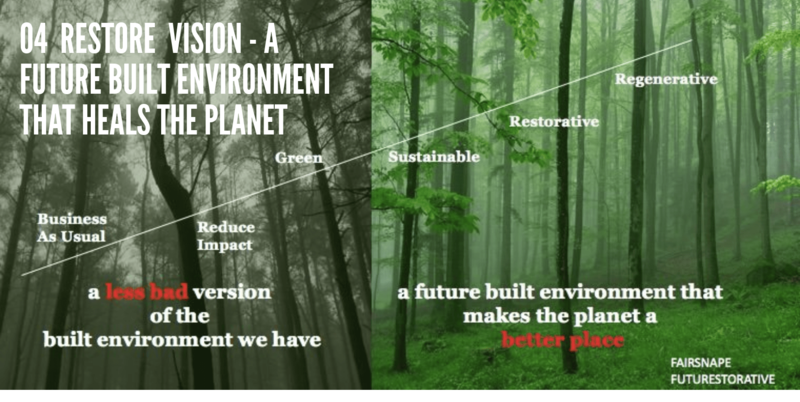 If any of the above comments seem a little negative and critical, forgive me, but the intention is to be constructively so, and after all, one of the Living Building Challenge advocacy messages is to ‘stir the pot’, … o challenge current thinking. This entry was posted in comment and tagged BREEAM, BrightestGreenest, Bullitt Centre, complexity theory, EuroFM, facilities management, FM, FutuREstorative, Health, healthy materials, Iain Murray, IoT, Living Building Challenge, net positive, people, Research, restorative sustainability, Smart Cities, social media, Strathclyde Uni, sustainability, Twitter, Vicki Lockhart, wellness, World FM Day, Yvon Chouinard on June 2, 2015 by martin brown. MB: What is inspiring you at the moment? Denis: Big change happening, but is it fast enough? That’s the question. I’m inspired by huge amount of talent and money flowing to sustainability investment and by young people rolling up sleeves to make things better. Denis: Media plays big role, for example President Obama engaging meteorologists, trusted and relevant Best place to effect change is in City Hall – whether as employees, elected, NGO, advocate. I’m bullish on cities right now. MB: … and on Nature and Natural Laws? Denis: We have been breaking lots of little laws in the built environment. Now the big law, Nature’s laws, are catching up with us. You can’t break Nature’s laws. When you try, you wind up proving them. We need to align human and natural laws, then economy will fall into place. And yes I agree we need more circular thinking, buildings only ‘borrow’ materials, we need to design with senescence in mind, the Building’s not mine. Biomimicry just makes good sense, nature has been beta testing ideas for millions of years, the least we can do is observe and learn. MB: What is the role of Big Data in sustainability? Denis: Analysis of big data is key, living buildings need cerebral cortexes and Central Nervous System to function, big data helps see patterns, offers vast potential, but right now there is too much noise and not enough signal and analysis. MB: How important is Equity within ‘Restorative Sustainability’? Denis: For too many people, environmental performance is a luxury. Race or income shouldn’t determine whether your building is full of poison. Everyone deserves clean air to breathe. MB: Why the Living Building Challenge as the standard for the Bullitt Centre? Denis: The LBC is most ambitious metric for sustainability in built environment. It’s hugely challenging. LBC Buildings sequester carbon, generate more energy than use, remove toxics from ecosystem and promote human health. LBC Buildings have no toxics, compost all waste, use only rainwater and sun, they put water back into soil to recharge aquifer. All are natural ideas. MB: why after 40 years of Earth Day are we still pessimistic? Denis: I’m writing a book – COWED – with my wife about the impacts of bovines on North America. COWED is not anti-cow but “pro-cow but with limits.” 93 million cows in America are way too many. MB: And finally your views on twitter and (sustldrconv) tweetchats? This article was originally co-authored by Martin Brown and Andrea Learned with contributions from Denis Hayes and Brad Khan. Martin Brown @fairsnape is a UK built environment sustainability and social media advocate, Andrea Learned @AndreaLearned is a US based social engagement and thought leadership strategist. Both are Guardian Sustainability Business contributors and are co-founders of Sustainability Leadership Conversations, a transatlantic and global twitter based social media programme that enables sustainability leadership sharing. Contact us to discuss support in amplifying your messages, experiences and commitment within the sustainability leadership arena through our monthly #SustLdrConv series and other social media programmes. This entry was posted in comment and tagged Denis Hayes, martin brown, sustainability on August 5, 2014 by martin brown.